Last weekend, Sunday night, I drove up to Bakersfield (about two hours outside of Los Angeles) with Peter from SlashFilm for the Rolling Roadshow screening of There Will Be Blood. If you're not familiar with the Alamo Drafthouse's Rolling Roadshow (official website), basically they host special screenings of cinema classics in locations where they actually take place or are otherwise connected. Years ago they showed Close Encounters of the Third Kind at Devil's Tower. This time they showed Paul Thomas Anderson's incredible film There Will Be Blood outside of the Kern County Museum right in the middle of their own oil exhibit. The photo above, and the one below, should give you an idea of the setting and location. 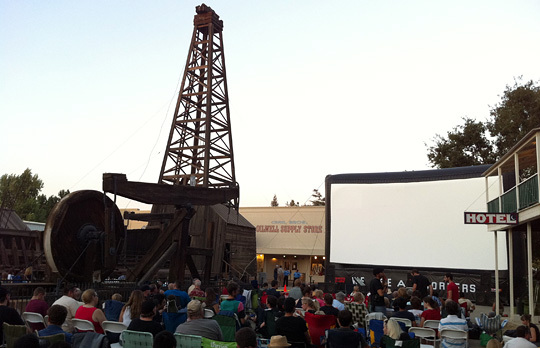 The giant inflatable screen (and project system running actual film reels, not digital) was installed right next to the gigantic oil derrick that Anderson actually visited and studied while he was working on the film. Needless to say it was an amazing, unforgettable cinematic (albeit outdoors) experience, partially thanks to There Will Be Blood being such a phenomenal film. It's undeniably an American classic and such a brilliant piece of cinema that I was so excited to watch in that setting, out under the stars, thanks to Tim League and the Alamo Drafthouse. I wanted to take this moment to highlight the event because it's these kind of amazing ideas that, to me at least, really keep the cinematic experience alive and exciting. There's really nothing like seeing a movie on a big screen, but then actually transplanting that experience to the actual location the film takes place. I wish every movie I saw was like that! Wouldn't it be cool to watch Lord of the Rings down in New Zealand in the same hills they built Hobbiton? Or watch the Star Wars trilogy outside of the Tatooine cantina? Okay, I'm getting a little ahead of myself, but this was seriously a superb experience that I'm glad I decided to attend. Do yourself a favor - if you're in any of the other cities where the upcoming Rolling Roadshow screenings are taking place - Chicago (The Blues Brothers), Detroit (RoboCop), Philadelphia (Rocky Marathon), New Jersey (On the Waterfront), New York City (The Godfather: Part II) - go see one of these shows. They're incredible and they'll remind you, as they reminded me, why I love movies and why I love cinema in specific so damn much. I have to thank Tim and the Alamo Drafthouse for even coming up with this, as it's so great to see this kind of experience striving in a world of digital downloads and Netflix Instant. "I drink it all up!" Sounds like a blast, thanks for sharing. I'm hoping I can catch On The Waterfront, or Godfather Part III. Hey, maybe they will come to Dallas and show ROBOCOP!! Alex, glad you could make it up to Bakersfield. What an amazing event it was. The ambiance with the derreck right next to the screen was unforgettable! I am so glad that I discovered this cinematic adventure thanks to you, and only 10 minutes from my house!